BELIZE CITY–Major crimes are up by 6% and murders up by over 20%, almost erasing the gains which Belize made in 2013 in reducing the murder rate below triple-digit figures. However, Ret’d. 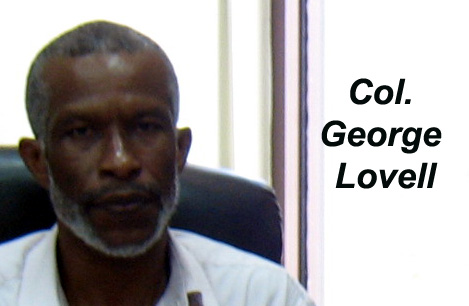 Colonel George Lovell, Chief Executive Officer in the Ministry of National Security, says that they are still hopeful that they could achieve their plan to reduce the murder rate to 8 per 100,000 which, he said, is the global average. Today, Belize’s murder rate is 34, and reducing that figure to 8 would mean reducing the murders to roughly 40 a year by 2020. According to Lovell, the upsurge in homicides is partly due to an increase in crimes of passion. He said that it does not matter how many police officers there are, since these crimes happen in private areas where friends sometimes are involved. “That needs another type of approach. We need to look at the whole aspect of our social sector and society itself to be able to reduce those types of crimes,” Lovell said. In 2015, Belizeans will definitely see a decline in gang-related homicides in Belize City, and so they can expect to have a safer city going into 2015, Lovell indicated. How do we get there? According to Lovell, the Ministry is in the process of building capacity not just for law enforcement agencies, but also for the entire social sector as well as the justice system. “We want to have a system where… the law is swift and where when somebody is identified as the perpetrator that there is justice brought and that person can be put in jail. We would then have to have a system for witnesses for a long time to come, to make sure nobody is threatening them,” said Lovell. Lovell said that this is “not just a talk shop,” as they are “putting quite a great deal of investment” into their strategy which, he said, began to be implemented in 2010. How do you gauge whether your plan is working or not? Lovell said that there are several ways they monitor, such as reviewing the annual report, which indicates where they are in relation to their goals and how they are progressing. The crime statistics are also another tool which shows them areas on which they need to focus a little bit more. “Are you a proponent of the death penalty?” we asked Lovell. “Not necessarily so!” he replied. He said, though, that if the Government and people would be in support of such a measure, he would not object. “It might put fear in a few but it will not necessarily address the core cause of the issue,” said Lovell. “I think it is beyond just the death penalty. That in itself certainly will not stop homicides from happening,” he further stated. He said that the murder conviction rate is still very low, so this is another area that needs to be addressed: “We must find a system to find them guilty,” the CEO said. Prosecutors still rely heavily on eyewitnesses to land convictions; however, according to Lovell, 2014 has seen greater application of forensic technologies to help solve crimes. Notably, 2014 has seen a sharp decline in arrests for murders, and Lovell said this could be due to the fact that people are still not prepared to come forth and testify, but it is also possible that investigative teams may not be as effective as they probably should be. “There will definitely be more involvement with forensic science services in terms of looking at some of these major crimes,” Lovell said. He told us that they will continue to work with all their sister agencies and partners, including the Ministries responsible for Fisheries, Immigration, Customs, Education and Human Development, as well as funders in the US, Britain and Taiwan to aid in capacity-building and efforts in making Belize safer for citizens and visitors. This year, tourists at the Caracol Archaeological Site were shocked by the broad daylight execution of Special Constable Danny Conorquie at the main temple area even while the tourists were on-tour at the site. This has led to greater reinforcements at that location in particular and more generally on the border. The CEO said that the Belize Defence Force (BDF) will be more involved with what has been happening on the borders. He pointed out that one new conservation post was erected near the border this year and a roll-out is planned in 2015 for other conservation posts and other initiatives on the border to make it safer. As for the Coast Guard, he said that they will continue to dominate maritime space, and the new forward operating base at Hunting Caye will be completed. “We have other operation bases planned for the Coast Guard. All the uniformed services will increase in numbers and strength until they are optimal. Each will have at least two intakes during the next fiscal period,” he said, speaking of the BDF, the Belize Coast Guard and the Police Department. The budget year begins in April 2015, and Lovell told us that they have already begun the process. The submissions will entail an increase in allocation of about 10%. However, Lovell said that they also rely on funds from international partners such as the US-funded Central America Regional Security Initiative (CARSI), the US Southern Command, the British, the Taiwanese and the Canadians to assist with the Capital III budget.